Chief among the logistical advantages of the Inland Empire (IE) are its proximity to the ports and its available space and labor – and all three factors are in great shape in 2018. Proximity to the Ports of Los Angeles and Long Beach. 2017 was a banner year for the Ports of L.A. and Long Beach as each moved the most TEUs in their 100+-year histories. 2018 looks to be even bigger as the National Retail Federation predicts that imports will be up 4.9 percent in the first half of this year. Where does all that cargo go? An ever-increasing amount – more than 75 percent of imported cargo – is headed about 65 miles east to the Inland Empire which has the space to handle it. And, while the thought of drayage costs related to that distance may cause alarm, you’ll quickly discover that those costs are offset by the lower warehousing and labor costs that the IE has to offer. Space to support growth. The biggest advantage that Inland Empire logistics has over the rest of Southern California is space. Los Angeles and Orange counties are essentially full in terms of industrial/warehouse space – with little-to-no vacancy or room to grow. Meanwhile, Inland Empire warehouse space is abundant and constantly growing. 21.9 million square feet of industrial space was added to the IE in 2017, and there is over 23 million square feet currently being constructed. In fact, 91 million square feet of industrial space has been added within the Inland Empire within the last five years alone. Much of this space is not only less costly than it is in L.A. or Orange Counties, it is newer space with the modern amenities that are often lacking in those areas. A thriving labor market. California employment is at an all-time high, and the Inland Empire is home to the biggest labor increase in the state – growing by 3.4 percent between 2016 and 2017. The biggest driver of this employment growth? 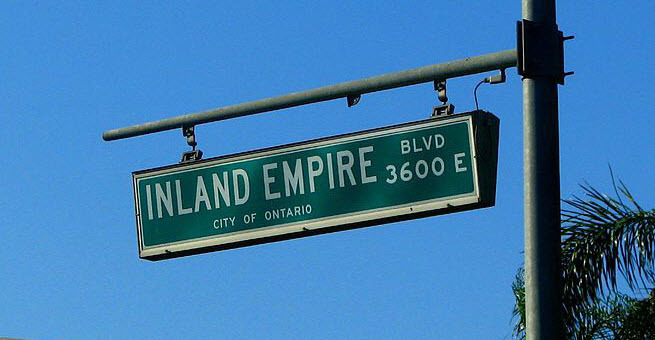 Inland Empire logistics. According to local economist John Husing, “About 20 percent of all our direct job gains have been in logistics.” This growth is tied to the building of new industrial space, the labor needed to perform warehousing and logistics operations related to that space, and the roadway and transportation enhancements required to support the region’s continued expansion. This growing labor pool is also less costly to employ, with median pay 7.1% and 5.8% lower than Los Angeles and Orange Counties, respectively. To take advantage of this prime location for your West Coast logistics operation, you can build, lease, and/or manage the space yourself – or, you can entrust your operation to a 3PL who already has that space, along with the labor and infrastructure to run it efficiently. By doing so, you can take advantage of a variety of 3PL services to help you reduce costs even further. These include shared warehousing in which you only pay for the space you need. KANE’s IE operation is based in Rialto and offers integrated warehousing, packaging, and transportation solutions. To learn more about KANE’s Inland Empire logistics services, contact us today.